Motorboat & Yachting: Trader Motor Yachts has revealed their 2016 edition of its popular 42ft aft-cabin model with a new joystick control for the Cummins powertrain. 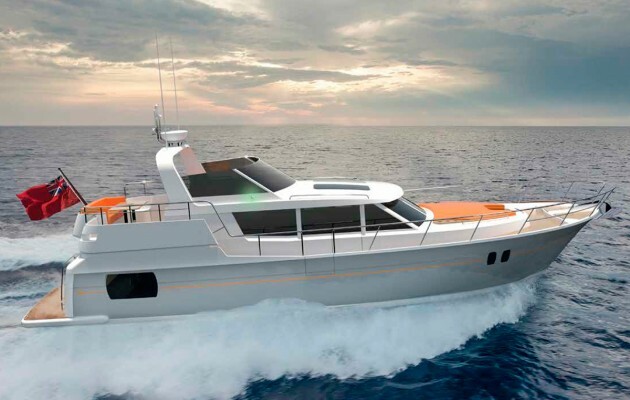 Engine options up to twin 480hp QSB 6.7 will be made available, giving this RCD Category A offshore cruiser a top speed in excess of 23 knots. Owners can also expect a quieter ride on the updated Trader 42, thanks to the new Wake Flow underwater exhaust system. Trader claims to have made more than 120 new developments on-board following feedback from owners. These include a diesel-powered central heating system, which should be better suited to long stays on board. A new hull window should bring plenty of light into the all-important aft-cabin, which features a diagonally-mounted double bed. Other key features include a sociable galley-up layout and a semi-displacement hull by world renowned naval architect Tony Castro. Based in Universal Marina near Southampton, Trader Motor Yachts sells direct to customers in the UK, while its European partner is Dutch brokerage firm Mazer Yachting.